Phytolacca americana, also known as American pokeweed, pokeweed, poke sallet, or poke salad, is a poisonous, herbaceous perennial plant in the pokeweed family Phytolaccaceae growing up to 8 ft (2.4m) in height. It has simple leaves on green to red or purplish stems and a large white taproot. The flowers are green to white, followed by purple to almost black berries which are a food source for songbirds such as gray catbird, northern mockingbird, northern cardinal, and brown thrasher, as well as other birds and some small animals (i.e., to species that are unaffected by its mammalian toxins). Pokeweed is native to eastern North America, the Midwest, and the Gulf Coast, with more scattered populations in the far West. It is also naturalized in parts of Europe and Asia. It is considered a pest species by farmers. [not verified in body] Additionally, pokeweed poses a danger to human and animal populations via poisoning; with toxicity levels increasing as the plant matures, and with poisonous fruit. The young leaves can be made edible by proper cooking. 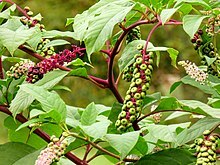 It is used as an ornamental in horticulture, and it provokes interest for the variety of its natural products (toxins and other classes), for its ecological role, its historical role in traditional medicine, and for some utility in biomedical research (e.g., in studies of pokeweed mitogen). In the wild, it is easily found growing in pastures, recently cleared areas, and woodland openings, edge habitats such as along fencerows, and in wastelands. Pokeweed is a member of the Phytolaccaceae, or broader pokeweed family, and is a native herbaceous perennial plant, that is large, growing up to 8 feet (2 meters) in height. One to several branches grow from the crown of a thick, white, fleshy taproot, each a "stout, smooth, green to somewhat purplish stem;" with simple, entire leaves with long petioles alternately arranged along the stem. Pokeweeds reproduce only by their seeds (large glossy black, and lens-shaped), contained in a fleshy, 10-celled, purple-to-near-black berry with crimson juice. The flowers are perfect, radially symmetric, white or green, with 4-5 sepals and no petals. The flowers develop in elongated clusters termed racemes. The seeds have a long viability and can germinate after many years in the soil. Birds are unaffected by the natural chemicals contained in the berries (see below), and eat them, dispersing the seeds. Seed are also found in commercial seed (e.g., vegetable seed packets). The berries are reported to be a good food source for songbirds and other bird species and small animals unaffected by its toxins. Distribution via birds is thought to account for the appearance of isolated plants in areas that had otherwise not been populated by pokeweed. P. americana or pokeweed is known as pokeberry, poke root, Virginia poke (or simply poke), pigeonberry, inkberry, redweed or red ink plant. When used in Chinese medicine, it is called chuíxù shānglù (垂序商陸). The plant and its properly-cooked leaves are also called poke sallet or more commonly poke salad, sometimes spelled polk salad. All parts of the plant are toxic and pose risks to human and mammalian health. In summary, the poisonous principles are found in highest concentrations in the rootstock, then in leaves and stems and then in the ripe fruit. The plant generally gets more toxic with maturity, with the exception of the berries (which have significant toxicity even while green). Children are most frequently poisoned by eating raw berries. Infants are especially sensitive and have died from eating only a few raw berries. Adults have been poisoned, sometimes fatally, by eating improperly prepared leaves and shoots, especially if part of the root is harvested with the shoot, and by mistaking the root for an edible tuber. Research with humans has also shown that common pokeweed can cause mutations (possibly leading to cancer) and birth defects. Since the juice of pokeweed can be absorbed through the skin, contact of plant parts with bare skin should be avoided. Pokeweed is to be avoided during pregnancy and children consuming even one berry may require emergency treatment. The plant sap can cause dermatitis in sensitive people. Birds are apparently immune to this poison. The plant is not palatable to animals and is avoided unless little else is available, or if it is in contaminated hay, but horses, sheep and cattle have been poisoned by eating fresh leaves or green fodder, and pigs have been poisoned by eating the roots. Human deaths resulting from pokeweed consumption are uncommon, but cases of emesis and catharsis are known, and a child who consumed crushed seeds in a juice is reported to have died. If death occurs, it is usually due to respiratory paralysis. Historically, pokeweed poisonings were common in eastern North America during the 19th century, especially from the use of tinctures as antirheumatic preparations and from ingestion of berries and roots that were mistaken for parsnip, Jerusalem artichoke, or horseradish. If taken internally, pokeweed is a slow acting but a violent emetic. Vomiting usually starts about 2 hours after the plant or parts of it have been eaten. Severe cases of poisoning result in purging, spasms, and sometimes convulsions. If death occurs, it is usually due to paralysis of the respiratory organs. Cases of animal or human poisoning should be handled by a veterinarian or a physician. The OARDC staff scientists note that immediate and subsequent symptoms of poisoning from pokeweed include "a burning sensation in the mouth, salivation, gastrointestinal cramps, and vomiting and bloody diarrhea", and that depending upon the amount consumed, more severe symptoms can occur, including "anemia, altered heart rate and respiration, convulsions and death from respiratory failure." If only small quantities of the plant or its extracts are ingested, people and animals may recover within one to two days. Pokeweed is native to eastern North America, the Midwest, the Gulf Coast, and the West coast states of the USA. Plant Type: Perennial herbaceous plant which can reach a height of 10 feet (3 meters), but is usually 4 ft (1.2 m) to 6 ft (2 m). However, the plant must be a few years old before the root grows large enough to support this size. The stem is often red as the plant matures. There is an upright, erect central stem early in the season, which changes to a spreading, horizontal form later in the season with the weight of the berries. Plant dies back to roots each winter. Stem has a chambered pith. Leaves: The leaves are alternate with coarse texture with moderate porosity. Leaves can reach sixteen inches in length. Each leaf is entire. Leaves are medium green and smooth with what some characterize as an unpleasant odor. Flowers: The flowers have 5 regular parts with upright stamens and are up to 0.2 inches (5 mm) wide. They have white petal-like sepals without true petals, on white pedicels and peduncles in an upright or drooping raceme, which darken as the plant fruits. Blooms first appear in early summer and continue into early fall. Fruit: A shiny dark purple berry held in racemose clusters on pink pedicels with a pink peduncle. Pedicels without berries have a distinctive rounded five part calyx. Fruits are round with a flat indented top and bottom. Immature berries are green, turning white and then blackish purple. Various sources discuss notable chemical constituents of the plant. [full citation needed][better source needed] Owen of Iowa State University notes that the "entire pokeweed plant contains a poisonous substance similar to saponin" and that the "alkaloid phytolaccine also occurs in small amounts." Heller at the National Library of Medicine notes the two natural products, the alkaloid phytolaccatoxin and phytolaccagenin, as contributing to human poisoning. The Canadian Poisonous Plants Information System echoes the information about phytolaccine and phytolaccatoxin. Triterpene saponins isolated from the berries of pokeweed uncharacterized as to toxicity include esculentoside E; and phytolaccasides C and F, and oleanolic acid, and 3-oxo-30-carbomethoxy-23-norolean-12-en-28-oic acid. Triterpene alcohols isolated include α-spinasterol and its glucoside, α-spinasteryl-β-D-glucoside, and a palmityl-derivative, 6-palmytityl-α-spinasteryl-6-D-glucoside, as well as a similarly functionalized stigmasterol derivative, 6-palmityl-Δ7-stigmasterol-Δ-D-glucoside. Other than starch and various tannins, other small molecule natural products isolated from pokeweed include canthomicrol, astragalin, and caryophyllene. Seeds contain the phenolic aldehyde caffeic aldehyde. Proteins of interest include various lectins, protein PAP-R, and pokeweed mitogen (PWM), as well as a toxic glycoprotein. Pokeweed berries are reported to be a good food source for songbirds such as gray catbird (Dumetella carolinensis), northern mockingbird (Mimus polyglottos), northern cardinal (Cardinalis cardinals), brown thrasher (Toxostoma rufum), other bird species including mourning dove (Zenaida macroura), and cedar waxwing (Bombycilla cedrorum). Small mammals apparently tolerant of its toxins include raccoon, opossum, red and gray fox, and the white-footed mouse. Pokeweed is used as a sometime food source by the larvae of some Lepidoptera species, including the giant leopard moth (Hypercompe scribonia). Some pokeweeds are grown as ornamental plants, mainly for their attractive berries. A number of cultivars have been selected for larger fruit panicles. Owen notes that "Indians and early settlers used the root in poultices and certain drugs for skin diseases and rheumatism." The late 19th century herbal, the King's American Dispensatory, describes various folk medical uses that led individuals to ingest pokeberry products. Phytolacca extract was advertised as a prescription weight loss drug in the 1890s. Pokeweed is promoted in alternative medicine as a dietary supplement that can treat a wide range of maladies including mumps, arthritis and various skin conditions. While pokeweed has been subject to laboratory research, there is no medical evidence that it has any beneficial effect on human health. Poke is a traditional southern Appalachian food. The leaves and stems of very young plants can both be eaten, but must be cooked, usually boiled three times in fresh water each time. The leaves have a taste similar to spinach; the stems taste similar to asparagus. To prepare stems, harvest young stalks prior to chambered pith formation, carefully peel the purple skin away, then chop the stalk up and fry in meal like okra. 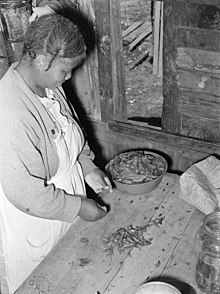 A typical recipe for preparation of pokeweed leaves is to remove the leaves from the plant, rinse the leaves in cool water, bring the leaves to a rolling boil in a large pot about 20 minutes, pour the leaves into a sieve (discarding the cooking water), rinse them in cool water, repeat the boiling and the rinsing at least two more times, panfry the leaves in bacon grease for a couple of minutes, add bacon, and salt & pepper to taste. The root is never eaten and cannot be made edible, but a late 19th century herbal, the King's American Dispensatory, describes various folk medical uses that led individuals to ingest pokeberry products, and festivals still celebrate the plant's use in its historical food preparations (see below). Plant toxins from Phytolacca are being explored as a means to control zebra mussels. The toxic extract of pokeweed berries can be processed to yield a red ink or dye. During the middle of the 19th century wine often was coloured with juice from pokeberries. Pokeberry shoots, drained after cooking by boiling (without salt). Elvis Presley covered the song. In Oklahoma, poke salad may be added to the annual Wild onion dinners. ^ a b Nancy L. Matthews, 1987, "Appendix F: Habitat Assessment Manual," in Report: Anne Arundel Co., Offc. Planning and Zoning, Environmental and Special Projects Div., to Office of Coastal Resources Management, NOAA and State of Maryland Chesapeake Bay Critical Area Commission, August 1987, 9 pages, passim see , accessed 2 May 2015. ^ a b c d e f USDA-ARS, 2015, "Taxon: Phytolacca americana L.," at National Genetic Resources Program.Germplasm Resources Information Network - (GRIN) [Online Database], National Germplasm Resources Laboratory, Beltsville, Maryland, see [permanent dead link], accessed 2 May 2015. ^ a b c Bailey, L.H., Bailey, E.Z., and the staff of the Liberty Hyde Bailey Hortorium, 1976, Hortus third: A concise dictionary of plants cultivated in the United States and Canada, New York, NY:Macmillan, ISBN 978-0-02-505470-7, see , accessed 2 May 2015. ^ Further unlisted names that appear in Hortus Third (Bailey, Bailey, et al., 1976, op. cit.) include: cancer jalap, oakum, garget, pocan, and scoke. ^ Further unlisted names that appear at WebMD include American Nightshade, American Spinach, Baie de Phytolaque d'Amérique, Bear's Grape, Branching Phytolacca, Cancer Jalap, Chongras, Coakum, Coakum-Chorngras, Cokan, Crowberry, Épinard de Cayenne, Épinard des Indes, Faux Vin, Fitolaca, Garget, Herbe à la Laque, Hierba Carmin, Jalap, Kermesbeere, Laque, Phytolacca Berry, Phytolacca americana, Phytolacca decandra, Phytolaque Américaine, Phytolaque à Baies, Phytolaque Commun, Phytolaque d'Amérique, Pocan, Raisin d'Amérique, Red Plant, Scoke, Skoke, Teinturier, Teinturière, Vigne de Judée. See WebMD, 2015, "Pokeweed," at WebMD: Vitamin and Supplement (online), , accessed 2 May 2015. ^ a b c d e f g John Cardina, Cathy Herms, Tim Koch & Ted Webster, 2015, "Entry: Common Pokeweed, Phytolacca americana", in Ohio Perennial and Biennial Weed Guide, Wooster, OH: Ohio Agricultural Research and Development Center (OARDC), see OARDC Pokeweed, accessed 2 May 2015. ^ a b c Jacob L. Heller, 2103, "Pokeweed poisoning", at MedlinePlus (online), October 21, 2013, see , accessed 2 May 2015. ^ a b c CBIF CPPIS, 2013, "All Plants (Scientific Name): Phytolacca americana," at Canadian Biodiversity Information Facility, Species Bank, Canadian Poisonous Plants Information System, (online), June 5, 2013, see , accessed 2 May 2015. ^ a b Amitava Dasgupta, 2011, Effects of Herbal Supplements on Clinical Laboratory Test Results, Volume 2, Patient Safety, Walter de Gruyter, ISBN 3110245620, see , accessed 2 May 2015. ^ "Plant Profile:Phytolacca americana L., American pokeweed". USDA Natural Resources Conservation Service PLANTS Database. Retrieved 16 November 2017. ^ a b c d Kang, S.S. & Woo, W.S. (1980). "Triterpenes from the berries of Phytolacca americana". J. Nat. Prod. 43 (4): 510–3. doi:10.1021/np50010a013. ^ Tang, W. & Eisenbrand, G., 1992, Chinese Drugs of Plant Origin: Chemistry, Pharmacology, and Use in Traditional and Modern Medicine, New York, NY: Springer-Verlag, p. 765. ^ Woo, W.S., Kang, S.S., 1979. A new phenolic aldehyde from the seeds of Phytolacca americana. Soul Taehakkyo Saengyak Yonguso Opjukjip 18, 30–31. ^ Other birds reported to include pokeweed in their diets include bluebirds, crested flycatchers, fish crows, hairy woodpeckers, kingbirds, phoebes, robins, starlings, and yellaw-breasted chats, see Matthews, 1987, op. cit. ^ Donald W. Hall, 2015, "Giant woolly bear (larva), giant or great leopard moth (adult) [scientific name: Hypercompe scribonia (Stoll 1790) (Lepidoptera: Erebidae: Arctiinae)]," at Institute of Food and Agricultural Sciences: Featured creatures, Gainesville, FL:Florida Department of Agriculture and Consumer Services, Division of Plant Industry, Table 1, see "Archived copy". Archived from the original on 2015-09-20. Retrieved 2015-05-03. CS1 maint: Archived copy as title (link), accessed 2 May 2–15. ^ a b John King, Harvey Wickes Felter & John Uri Lloyd, 1898, "Entry: Phytolacca," in King's American Dispensatory, Cincinnati : Ohio Valley Co., see  and , accessed 2 May 2015. ^ The Medical and surgical reporter (69th, July-Dec 1893 ed.). Philadelphia, Pa.: Crissy & Markley, Printers. p. 1561. ^ a b Ades TB, ed. (2009). Pokeweed. American Cancer Society Complete Guide to Complementary and Alternative Cancer Therapies (2nd ed.). American Cancer Society. pp. 466–469. ISBN 9780944235713. ^ "How to Identify, Harvest and Prepare Pokeweed and Poke Sallet". Delishably.com. Retrieved December 14, 2018. ^ Harold H. Lee, Lemma Aklilu, and Harriett J. Bennett, 1992, The use of Endod (Phytolacca dodecandra) to Control the Zebra Mussels (Dreissena polymorpha), Chapter 37, pp. 643-656, in Zebra Mussels Biology, Impacts, and Control, Thomas F. Nalepa & Don W. Schloesser, Eds., Boca Raton, FL:CRC Press, ISBN 0873716965, see , accessed 5 May 2015. ^ ‹See Tfd›US application 5252330, ‹See Tfd›Harold H. Lee; Peter C. Fraleigh & Lemma Aklilu, "Method of controlling zebra mussels with extract of Phytolacca dodecandra", published 1993-10-12, assigned to University of Toledo. ^ Pesha Black & Micah Hahn, 2004, "Pokeweed, Phytolacca americana, Family: Phytolaccaceae," at [Guide to] Practical Plants of New England (student project pages), see "Archived copy". Archived from the original on 2015-02-17. Retrieved 2015-05-03. CS1 maint: Archived copy as title (link), accessed 2 May 2015. ^ Brooklyn Botanical Garden. "Weed of the Month: Pokeweed". www.bbg.org. Retrieved 23 September 2017. ^ Tull, Delena (2013). Edible and useful plants of the Southwest : Texas, New Mexico, and Arizona : including recipes, teas and spices, natural dyes, medicinal uses, poisonous plants, fibers, basketry, and industrial uses (Revised ed.). University of Texas press. p. 257. ISBN 978-0-292-74827-9. Retrieved 23 September 2017. ^ Nilsson et al. 1970. "Studies into the pigments in beetroot (Beta vulgaris L. ssp. vulgaris var. rubra L.)"
^ Doppelbauer, Martin (2008). "Tony Joe White - His Music". Archived from the original on May 3, 2015. Retrieved May 2, 2015. ^ White, Tony Joe (1969). "Polk Salad Annie [Lyrics]". New York, NY: Sony/ATV Music Publishing. Retrieved May 2, 2015. ^ a b APSFA, 2015, "Schedule of Events," at The Annual Poke Salad Festival Association, Annual Poke Salad Festival, Blanchard, Louisiana, at "Archived copy". Archived from the original on 2015-03-25. Retrieved 2015-05-03. CS1 maint: Archived copy as title (link), accessed 2 May 2015. ^ "Poke Sallet Festival ['Browngrass will join them ... ']". The Jackson County Sentinel (Online ed.). April 28, 2015. p. 4. Archived from the original on 2015-05-05. Retrieved May 2, 2015. ^ "Poke Sallet Festival Pageant". The Jackson County Sentinel (Online ed.). April 21, 2015. p. 3. Archived from the original on 2015-05-05. Retrieved May 2, 2015. ^ "Harlan County Poke Sallet Festival - Home". Retrieved 5 April 2016. P.A.G.M. De Smet, 1993, "Phytolacca americana," in Adverse Effects of Herbal Drugs, Volume 2 (Peter A. G. M. Smet, Konstantin Keller, Rudolf Hänsel, & R. Frank Chandler, Eds. ), Berlin:Springer Science & Business Media, ISBN 3642489060, see , accessed 2 May 2015. ACS, 2008, "Entry: Pokeweed," at Find Support & Treatment; Treatments and Side Effects Complementary and Alternative Medicine; Herbs, Vitamins, and Minerals, see ACS Pokeweed entry, accessed 2 May 2015. Tyler, V. E.; Brady, L. R. & Robbers, J. E., 1988, "Poisonous plants," in Pharmacognosy, 9th ed. Philadelphia:Lea and Febiger, Chapter 15, pp. 438–455. Elvin-Lewis, Memory P. F.; Lewis, Walter Hepworth (2003). Medical Botany: Plants Affecting Human Health (2nd ed.). Chichester: John Wiley & Sons. p. 82ff. ISBN 978-0471628828. "Tony Joe White - Polk Salad Annie," performance, date unknown, at , accessed 2 May 2015. "Tony Joe White and Johnny Cash," performance, 1970, "Polk Salad (Poke Salit) Annie," from Johnny Cash Show, episode no. 27, April 8, 1970, at LiveLeak (online), see , accessed 2 May 2015. Brennan Carley, 2014, "Foo Fighters Join Tony Joe White on Bluesy 'Polk Salad Annie' on 'Letterman'," Spin (online), October 16, 2014, see , accessed 2 May 2015. Wikimedia Commons has media related to Phytolacca americana. "Complete Pokeweed Information". Drugs.com professional. Ellingwood, Finley. "Phytolacca americana". The American Materia Medica, Therapeutics and Pharmacognosy. Felter. "Pokeweed" (PDF). Materia Medica. Lloyd, John Uri. "Phytolacca americana". Kings American Dispensatory. "Phytolacca americana". Flora of North America. Kinneer, David & Burrows, Donna (October 30, 2013). "Pokeweed and Bluebirds". Native Brush & Shrubs. Weimar, Texas: Oakridge Ranch Wildlife Management Association. Image of bluebird feeding on pokeweed. Wang, Kim. "Pokeweed". Things my mother has taught me over the years.